- Mouthpiece are generally made of hard rubber, although some inexpensive mouthpieces may be made of plastic. Other materials such as crystal/glass, wood, ivory, and metal have also been used. - Body The control With the key. And mechanisms to control the sound. - Bell Contrary to popular belief, the bell does not amplify the sound; the bell curves up and forward and is usually made of metal. The range of the alto saxophone is from concert D♭3 (the D♭ below middle C—see Scientific pitch notation) to concert A♭5 (or A5 on altos with a high F♯ key). As with most types of saxophones, the standard written range is B♭3 to F6 (or F♯6). Above that, the altissimo register begins at F♯ and extends upwards. 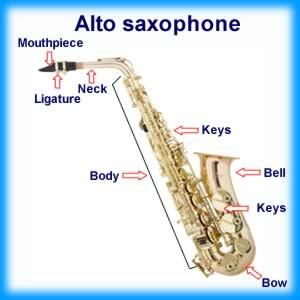 The saxophone's altissimo register is more difficult to control than that of other woodwinds and is usually only expected from advanced players.